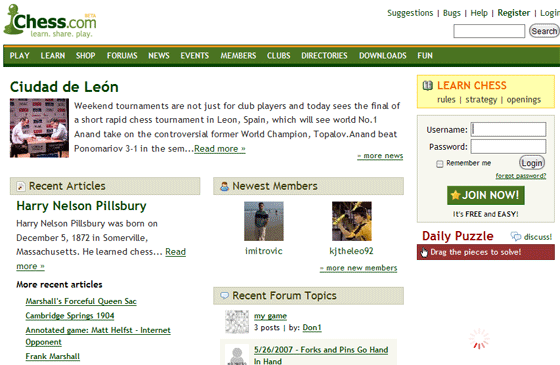 Finishing off our week of niche social networks comes a newish social networking offering from chess portal Chess.com. Chess.com is dedicated to becoming the premier online social networking community for chess players world wide. Chess.com aims to provide an environment where chess players of all skill levels can learn, contribute, play, build, chat, and share. Chess.com comes with the standard array of features including profiles, blogs, friends, events, video sharing and email. The social network launched in June and is on its way to 10,000 members. Catering for a niche audience doesn’t necessarily require aesthetic beauty (although admittedly it does help), content and community ultimately drives success. As much as some of the members of Chess.com make Chris Pirillo look like Brad Pitt, there’s little doubt that the site has something to it, besides a url that could potentially be worth $1million by itself. If you’re heavily into chess, Chess.com is worth a visit.